Welcome to the panStamp blog ! This is my first post so I'll try to introduce the project and summarize its main goals in order for the subsequent posts to seat on well reasoned basis. I don't mean that everything is clear at this very primary stage but, behind the multiple unknown variables that decorate the future of this project there are some solid ideas that will help me bring it to an useful and productive end. In some way, this weblog will try to relate the progresses of the panStamp project, from its conception up to the commercial release. Having to write about my daily work, about my ideas and decisions may help me take the necessary pause between milestones and, at the same time, let me open a window to new fresh ideas. 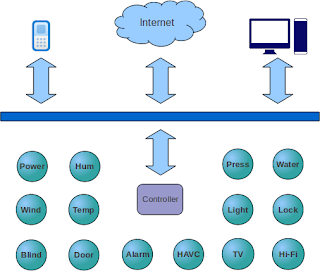 “A WPAN (wireless personal area network) is a personal area network - a network for interconnecting devices centered around an individual person's workspace“. Create a complete ecosystem of wireless devices, capable to communicate with real things, the whole integrable with other RF or IP equipments. Develop small OEM boards with the necessary components to start playing with low-power RF projects easily. This will include the development of mother boards, libraries, drivers and PC applications. Use open source tools during the complete development of the project. This requirement aims to facilitate the cooperation of other developers and reduce the learning curve for future customers/adopters of the solution. All the above goals will surely evolve into finer requirements during the next weeks. Nevertheless, this post does not pretend to become the actual project plan – this is just a first introductory post. Please stay tuned for the rest.